Once you have your beginning chain, single crochet in the third chain from the hook. To further help a flared beginning edge, you will not work the single crochet where you normally work it. You will be working your single crochet by inserting the hook directly above the bottom leg of the loop. In other words, you will only be leaving the lower-most edge of the chain exposed. It’s a bit slower to get in that spot all the way across the chain, but it looks very polished, and you may not be edging the blanket, so it’s important that the raw edges look professional. Working across your starting chain, work (single crochet, chain 1, skip 1 chain) repeat across, ending on a single crochet. We’ve already discussed what to do if you have 1 chain left over. Chain 2, pull second chain tight to reduce the turning chain height, and turn. Work (single crochet, chain 1) across, placing the single crochets in all of the chain 1 spaces and skipping over the single crochets. End by placing a single crochet in the turning chain. Chain 2, pull second chain tight, and turn work. Repeat this row until your blanket reaches desired length. This makes for a very stretchy blanket! I always work the blanket with two worsted strands held together and a size 10mm hook, because I think this simple stitch looks so much richer with the added texture of two strands. I sometimes work a border around the blanket by working 3 single crochets in all four corners and a single crochet in all stitches around. I have even worked a (single crochet, chain 1, skip stitch) border to keep the pattern – it’s very pretty! There are two color options that I choose from when I make this blanket. A: Work 11 stripes – 5 in bold colors and 6 in grey. I love this! 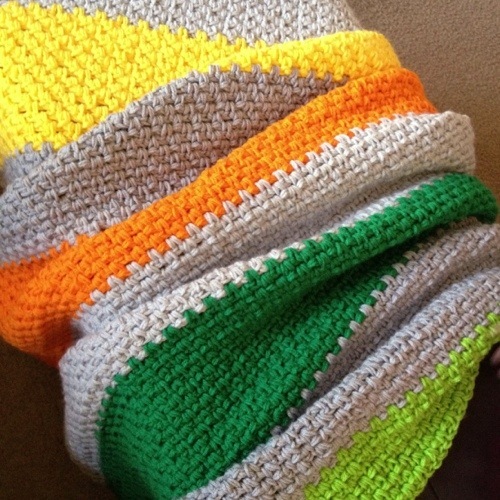 B: Using the Random Stripe Generator (link in sidebar) I plan out my blanket. Both are wonderful. Have fun! Let me know if you have questions. 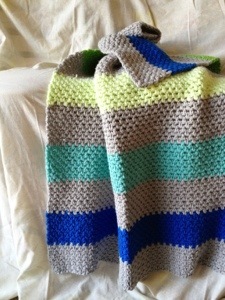 I know the stitch is simple, but when I share my Bold Stripe blankets, I always get asked about the stitch. The secret is in the double-stranded construction, the carefully placed foundation row, and the subtle overall texture. Enjoy some pics, or check out all of my Bold Stripe Blankets here! 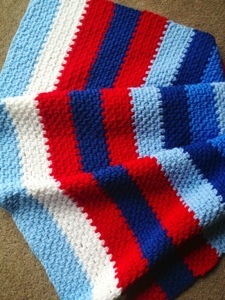 Posted in Bold Stripe, Free PatternsTagged Blanket, Crochet, StripesBookmark the permalink. I’d so Love to see this in a video! Do you have a YouTube? I don’t make YouTube videos at this time, but if you search “crochet moss stitch,” “woven stitch,” or “linen stitch” you should find more info! 🙂 Thank you! I saw someone use this stitch, though they called it ‘linen stitch’ and thought it was really lovely. I think your one with the two strands looks even better. Makes a lovely blanket. Thanks for your quick answer! Your Afghans and blanket are just beautiful!!! I made this blanket with two strands and it turned out super thick, chunky, warm and HEAVY. I used Vanna’s Choice Medium No.4 100% Acrylic Yarn. Guess should’ve used either a thinner yarn or single strand. Hey thanks…would you recommend to undo this blanket though? This was meant to be a gift! It looks great, feels warm just that its very heavy..!! 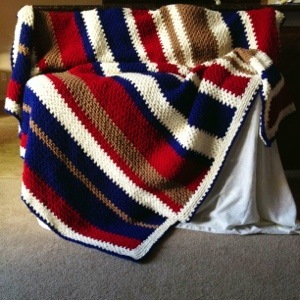 Hi, I was wondering how many rows of each you would suggest for the stripe? I’m using double stranded yarn. 🙂 Amazing work!!!!! You’re my crochet blanket hero. Hello! 🙂 I like 10 rows per stripe when I’m using two strands worsted. Thanks so much! Her videos got me started! 🙂 blessings! I would say I use about 25-30 ounces of worsted weight for a 32×42″ blanket – hope that helps some! 🙂 Happy crafting!